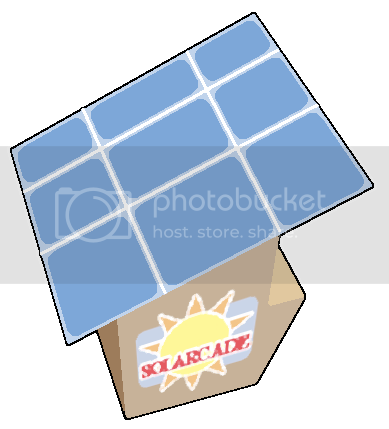 ive decided that i want to make a solar powered arcade cabinet. its an idea that a year or so ago during a renewable energy class. and now, with a bit of preliminary research, a demo for one of the games, and a nicely ripened project vision under my belt i decided to take the project seriously. theres a big community event that the organization i work for is putting on in may, so thats my deadline im aiming for. so i started a thread because ive always wanted to have a thread, and also because it will be a way to motivate me and store my plans, and to get some help and feedback! get it?! solarcade! its like, a solar arcade ya. so im doing this project for a handful of reasons. one of the earlest reasons was inspried by artisinal foods and their idea of value added products. the games i want to make are in many (and sometimes intentional) ways, crappy. but like all indie game developers, i have the dream that someday i could support myself making the games i love making. but by themselves, my games arent worth much. but as a farmer turns $10 of grapes into $100 of balsamic vinegar, i think that an funky arcade cabinet could really improve the experience of my games. since it would be portable, i could rent it out to events ($100 for a day? ), i could get local companies and restaurants to sponsor it and have their names cycle through at the bottom of the screen, and of course i could have a little donation box or something. also, for the field im going into it would be a good project to have on a resume. it will give me good experience with carpentry, electrical engineering, and also design. and of course it will be a great excuse to spend more time making games. a big part of it will be the games im making especially for it. but also, besides being loaded up with all sorts of emulators, i want it to be a exposition of the indie gaming community! if any of you guys want your games on it, that would be so awesome. what do you guys think? there are a lot logistics that need to be worked out in terms of hardware and ive got a pretty ambitious plan for the games i'll be making for it. im hoping that there are a couple people here with arcade cabinet experience. i guess i'll post this and then reserve the next couple posts for game and cabinet development. im pretty sure that this thing will actually be a computer impeded into an arcade cabinet with high quality arcade controllers. so now im looking for the builds with which to build a light, energy efficient computer. my friend showed me this motherboard, which seemed pretty good. the monitor is a really important component. a crt would really be more authentic, but because of its weight and energy consumption, im thinkig to go with a flatscreen, which i could use personally when the arcade isnt being used. the main thing with the monitor i think is glare, especially since this thing will be outside a lot. one monitor that i was looking at was the LG Flatron W2252TE, but i dont know about its screen. the powersupply and fan will be big consumers too, once i get an idea of the needs of each piece, i can start to calculate how many batteries and how large of an array i'll need. average photovoltaic performance is about 10-15 watts per sqft i think, so storing up energy in the batteries while its not being used will be very important. My first thought is that light and TV displays don't generally mix. Then I see your games with so many bright colors and think that'll compound the problem. You need to increase the contrast in your games or on a bright sunny day when the batteries are full the game will be unplayable. But maybe I'm wrong. You're actually building it so will have the final word on what works or not. no thats a reallly good point, ive been wondering about it myself. theres very little contrast in my game, there will probably be more in the other games, but still no one can appreciate my asthetics if they cant see it. on the other hand, the screen will be sunk a bit into the cabinet, which will have like a 5x5 or so pv array sitting on the top, and the screen will facing directly away from the sun. but even then , there is a lot of ambient light on a sunny day. i'll have to do some tests. what kinds of monitors are best for sunny situations? There's also the factor of bugs, as in real bugs, that could disrupt the system, remember that. Use some of the solar power to make the unaware bugs burn away! ya, some flatscreens are really good with not glaring, but there are some glossy ones that i hear are like mirrors. i was hoping that i wouldnt need to put glass in front of it, but it would be much safer. ya, it will be very important to make this thing built for rugged. but its not going to be installed outside, at night it will sleep indoors, so there wont be as many bugs to disrupt my system. I guess you wouldn't need the glass since it hopefully won't be in the rain and such. all this feedback makes me but i think i should continue my progress here, so as not to hog the community thread. Why are you here, slimeball?! [add response of protaganists:] Gasp! Petroleum is not just a fuel! It's a means of control! I have environments to pollute! My feeling is that three lines of text with no animation is about the limit for a punchy script in this format. So the last bit is still twice as long as it should be -- if you could have some funny picture to illustrate the cycle of dependency come up for the cycle of dependency line (and stay for the next two lines), I think that would really make it work. Perhaps an image where petrolimus suddenly has a chart illustrating the cycle, like he's breaking out powerpoint slides ... and maybe has a little graph of $ vs death with both rising, or something silly like that? I definitely agree. Also, if you even just changed something like the face of the characters after each line, just a tiny bit, it'd make it look much more dynamic. In the long bits it gets a little boring which is a pity because when it's moving it looks lovely. what are you doing here slimeball? i've come to inform you that this quaint little heath is going to be the home of my new oil drill! with this last bit of oil extracted i will be able to finish my indomitable fortress city, petropolis! why big miles into the ground for a insignificant amount of fuel when there's heaps of sunlight hitting every squarefoot of the Earth's surface every second? fools, the petroleum is not just a fuel, its a means of control! through pollution, all will be consumed within the vicious cycle of dependency. enslaved by the poison yet forced to embrace it for sustenance and industry! but enough talk! i have environments to pollute! From this meadow, i will extract the last bit of oil needed to finish my indomitable city, Petropolis! Why would you dig for oil, when there's abundant fuel all around us? Fool! Petroleum is not just a fuel, its a means of control! As alternative resources are destroyed through excavation and pollution, reliance on a fuel that only i possess increases! But there will always be sun and wind! We'll see about that! Soon all will be dependent on me! but enough talk! I have environments to pollute! i believe i changed it to energy in the final version. currently i feel like the project falls way too short of the things i believe and would like to express/share with people, especially when it comes to game play. so im back to the drawing board as to how to let people experience my message, rather than just telling them. i'll let you know when that inspiration bubbles up, or when i raise enough money to begin my cabinet! Wow! Didn't see that coming, Micheal. I have no idea how to go about doing such a thing, but I wish you the best of luck!